I met Dr. Wolff in December 2013 and was quickly diagnosed a hip labral tear with cam impingement. I decided to go ahead with labral tear repair surgery which he performed in April 2014. After 4 weeks on crutches and small steps forward, I started an intense 6-month period of rehabilitation and physiotherapy. In August 2014, I walked the John Muir trail and in December 2014, I climbed Mt. 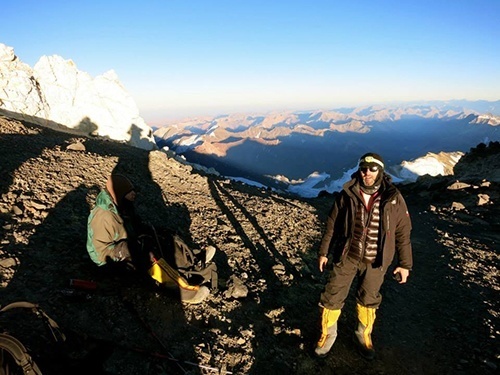 Aconcagua (23,000 ft.) I am ready now to start training for a marathon. Dr. Wolff has been superb. He has great attention to detail, he listened to my every need and answered every question during our visits. He is extremely personable and proved to be available at any time during my pre- and post-surgery period. His staff has been outstanding. I would highly recommend him. Running is my big passion and after years of hip pain, thanks to Dr. Wolff, I can finally run pain-free!